The second of the three divisions that make up the Mesozoic era, the Jurassic period saw warm tropical greenhouse conditions world-wide, shallow continental seas, the break-up of Pangea, cosmopolitan flora and fauna, and the triumph of the majestic dinosaurs and the great sea reptiles. The name Jurassic comes from the Jura Mountains on the border of France and Switzerland (actually an extension of the Alps into eastern France), where rocks of this age were first studied. In 1795 Alexander von Humbolt described massive limestone formations of the Jura Mountains in Switzerland as the Calcaire de Jura, or Jura-Kalkstein ("Jura Limestone"), which he wrongly believed were older than the (Triassic) Muschelkalk. Between 1796 and 1815 William Smith published geological maps featuring strata that were referred to by William Buckland in 1818 as the Oolite Formation or Oolitic Series. These were divided into Lower, Middle and Upper Oolites. In 1822 Conybeare and Phillips named the underlying strata as the Lias. From this Alexander Brongniart used the term Terrains Jurassiques, although only for the "Lower Oolite" The names Lias and Oolites continued to be used in Britain until quite recently. In 1839 Leopold von Buch formally named the rocks described by von Humbolt as the Jurassic System, from whence the term has come into general use. The immense wealth of fossils in Jurassic sediments of Britain (especially ammonites) meant that biostratigraphic zonation was further advanced for Jurassic sediments than for other periods. The terms used to divide the Jurassic Period into early, middle and late - Lias, Dogger, and Malm, are ones that originally referred only to English sediments. The fact that the remains of many dinosaur and sea reptile remains have been found from the early nineteenth century on contributed to the Victorian imagination regarding "antediluvian monsters." Much more recently, the word Jurassic has become a household word with the success of Speilberg's rather absurd movie about genetically resurrected dinosaurs, Jurassic Park, based on a disappointing novel by Michael Crichton of the same name (actually the novel starts out quite well, but quickly slides into fantasy). Ironically most of dinosaurs featured in Jurassic Park actually lived during the following, Cretaceous, period. But then Cretaceous Park just doesn't have the same ring now, does it. The Jurassic saw disintegration of Pangea that began in the Triassic continuing apace. The supercontinent begins to rotate, but the different components of the huge mass rotated at different rates and then in different directions, forming rift valleys. One of these opened the southern part of the North Atlantic Ocean and continued westward into the Gulf of Mexico. This was North America drifting westward, opening the Gulf of Mexico, forming the central Atlantic. As Greenland-North America separate from Europe-Africa and slide over the Pacific Ocean floor, mountain-building events are triggered that created the North American Cordillera (the Rocky Mountains and the Sierra Nevada). A huge arc was built on western North America and the Nevadan orogeny begins. Cimmeria begins its collision with Laurasia to form the Cimmerian orogeny. In Gondwana the initial narrow split between South America and Africa that began during the Triassic widened into a configuration resembling the present-day Red Sea. New sea floor formed along the nascent South Atlantic. This lengthened into a long, narrow seaway between South America and Africa. The Western side South America was subducted by an opposing oceanic plate. A great rift separates Antarctica from the southern ends of South America and Africa, developing an arm that extends eastward from South Africa along what is presently the eastern side of India, which began drifting northward.. Volcanoes located along these rifts erupted and issued huge amounts of basaltic lavas. The separated segments of Gondwanaland move slowly northward, turning gently counter-clockwise. Early rifting along the Australia-Antarctica join provided moist forested conditions that became coal deposits. During the Jurassic the extent of the oceans was far more widespread then they had been in the Triassic. The Jurassic sea level rose and flooded large portions of the continents. Shallow epi-continental seas spilled out of the Tethys and Proto-Atlantic and spread across Europe, leaving a rich sedimentary record of limestone with fine clastics adjacent to the highlands. These warm shallow seas were home to a rich diversity of life. The spreading ocean crawled across Russia and into what is now the Arctic Sea before retreating at the end of the period. Meanwhile much of central North America was flooded by wide sea way that at its height extended into central Utah. This continent-wide embayment has been dubbed the Sundance Sea, and was fringed by strips of continental land on three sides. On land gymnosperm plants were well represented. The superficially palm-like Cycadophyta (Cycads) were so abundant and diverse that the Jurassic period could well be called "the Age of Cycads" Some cycads were tall palm-like trees with rough branches marked by leaf scars, and pinnate (fern-like) leaf fronds. Other, unrelated forms, the equatorial flowering Bennettitales, were the most important group of shrubby trees, with short and stubby with squat bulbous trunks from the top of which the fronds grew. Conifers continued to be the most diverse large trees, and included representatives of the extant (still living) families Araucariaceae, Cephalotaxaceae, Pinaceae, Podocarpaceae, Taxaceae, and Taxodiaceae, along with the extinct equatorial Cheirolepidiaceae. Ginkgos were important, particularly in mid to high northern latitudes. Dicksoniaceous tree ferns and Caytoniaceous seed ferns were relatively successful plants in the shrubby tree size range. The Cyatheaceae tree ferns may have (and still do) reach(ed) heights of 20 meters. Osmundaceous, matoniaceous, and dipteridaceous ferns were probably the dominant undergrowth and small plants. Lycopods remained relatively insignificant and sphenopsids were represented by the small (and still surviving "living fossil") Equisetum or "horsetail"
In the seas there was a great diversity of invertebrates. Sponges, corals, bryozoa, gastropods, bivalves, and ammonoid (left) and belemnite cephalopods all flourished, the latter two groups becoming the dominant nektonic invertebrates for the rest of the Mesozoic. Brachiopods and Crinoids continued, but with nowhere like their Paleozoic glory. Freshwater bivalves (clams), snails, and branchiopod Crustacea were common. On land, numerous groups of herbivorous insects were present, including the orders Orthoptera, Hemoptera (among which were the superfamilies Cicadelloidea and Fulgoroidea (leafhoppers), Psylloidea (plant hoppers), Pentatomoidea (shield bugs), and Cimicoidea (plant bugs)), Thysanoptera (thrips), Coleoptera (beetles, including most extant groups) and primitive Hymenoptera (sawflies). Pulmonate snails, millipedes, scorpions, spiders and mites were certainly present, but are not known from fossils. As for the vertebrates, modern shark groups begin to appear. Bony fish are still mostly the intermediate heavy scaled holostean type, although the first teleosts appear early in the period. The gigantic Leedsichthys, a huge, scaleless filter feeder, reached 10 or even 30 meters in length, and filled the same ecological role as modern baleen whales. On land, a few basal tetrapods struggled on, but most amphibians were of essential modern types (frogs and newts), although the most primitive representatives of those orders. 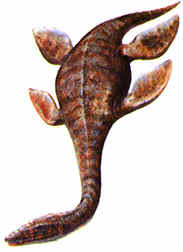 Sphenodont lepidosaurs took the same ecological role as lizards do today. Crocodiles were abundant and diverse, and included marine, semi-aquatic and even a few small lizard-like terrestrial forms. In the oceans new types of ichthyosaurs replaced their Triassic predecessors. The cousins of the Triassic nothosaurs, the long-necked plesiosauroids and short-necked pliosauroids, were also common. All these marine reptiles, filled similar ecological roles to cetaceans of the Cenozoic. In the air were various types of pterosaur, these were mostly small to medium-sized forms, all were endothermic with a covering of fur. Dinosaurs were diverse and abundant, and their was a rich megafauna of huge sauropods (including a number of families - Euhelopidae, Cetiosauridae, Brachiosaurus, Camarasaurs, Diplodocidae, etc), reaching many tons in weight, and the more modestly sized Scelidosauridae, Stegosauridae, and the camptosaurid iguanodonts. The browsing pressure these great beasts exerted on the vegetation must have been tremendous, although there is continuing argument whether the dinosaurs were ectotherms, endotherms, homeotherms, gigantotherms, or (as seems most likely) some combination of all of the preceding. Obviously, the higher their metabolism the greater the selection pressure they would have exerted on the contemporary vegetation. Along with the giant herbivores there were also the small fleet-footed "fabrosaurs", scutellosaurs, and hypsilophodontids, the "gazelles" of the dinosaurian world. These plant eaters were kept in check by a variety of carnivorous (theropod) dinosaurs, including small lightly built coelophysids, compsognathids, and ornitholestids, and larger (from several hundred kilos to several tons in weight) dilophosaurids, Ceratosauria, Torvosauroidea, and Allosauridae. Some of the smaller carnivores developed feathers and took to the air, these were the proto-bird Archaeornithes. A few tritylodontid therapsids straggled on, but it was a diverse assemblage of Mesozoic Mammals that played an important part of the microvertebrate fauna, filling the same ecological role as Insectivora and rodents do today. There must surely have been something special about the Jurassic oceans. Of the dozen or so types of planktonic organisms with a fossil record, at least four either first evolved or experienced massive radiation during Jurassic: coccolithophorids (evolved latest Triassic), diatoms (evolved Late Jurassic), dinoflagellates radiated Jurassic), planktonic foraminifera (?evolved or radiated Jurassic), and ostracodes radiated Jurassic). Most plankton groups experienced greater prominence yet in the Cretaceous. However, there seems to have been -- literally -- something in the water during the Jurassic. That "something" may simply have been lots of free calcium with which to build shells and tests; but, that would not explain the ostracodes and microcrustaceans that also seem to have found the Jurassic seas particularly congenial. Nor were these the only marine groups who left Jurassic microfossils. The "modern" coralline group of the Rhodophyta (red algae) evolved in the Jurassic. They are called modern to distinguish them from the Paleozoic corallines. The current view is that the modern and Paleozoic corallines are unrelated. However, the otherwise unidentifiable Middle to Late Jurassic Iberopora may be a late member of a transitional taxon. Schlagintweit 2004). It would be useful to be more certain, since it has been suggested that the "something in the water" was the rhodophytes themselves -- or, rather, their chloroplasts. All of the new photosynthetic forms of the Jurassic were "red," with chloroplasts of the red algae type, with chlorophyll c, rather than the chlorophyll b of green plants and green algae (Chlorophyta). Falkowski et al. (2004). It is almost certain that these chloroplasts were "adopted" from red algae by some secondary symbiosis, rather than by descent from the Rhodophyta. Grzebyk et al. (2003). Both of the last cited papers are from the Coastal Ocean Observatory Laboratory at Rutgers so (although it pains us to fall victim to so obvious a linguistic ploy) we'll refer to them as the COOL group. The COOL workers offer two reasons to explain why the ocean is "red." First, the Mesozoic rhodophyte chloroplast was a sturdy, self-reliant sort of plastid which had retained a much greater amount of its own DNA, and thus had greater genetic independence from its host. Consequently, by the Mesozoic, it was much easier for the red chloroplast to trade symbionts than it might have been for some debased, decadent green chloroplasts, which had surrendered most of its genetic control to its hosts. Second, the COOL group notes that red and green species are associated with different trace element requirements. The "red" elements are cadmium, cobalt and manganese, while the "green" elements are copper and iron. This leads the COOL group into a somewhat confused discussion of ocean anoxia and its effects on trace element availability. We suggest that they are correct about trace elements, but for the wrong reasons. Marine iron concentrations are largely dependent on continental weathering. Iron is high when the winds drop iron-bearing dust weathered from barren, arid inland areas. The rising seas and humid, equable conditions of the Mesozoic strongly reduced the availability of marine iron. It is not really necessary to invoke anything more complicated; however, we may also note that sulfides produced at the highly active Mesozoic mid-ocean ridges would also draw down dissolved iron as insoluble pyrite. The Jurassic was also, in a small way, a good time for acritarchs. Acritarchs are just curiously shaped organic casings, without any particular phylogenetic identity. The Jurassic variety are probably some type of radiolarian-like protist and may have nothing at all to do with the Paleozoic acritarchs. For radiolarians of the more conventional type, the Jurassic was also favorable. 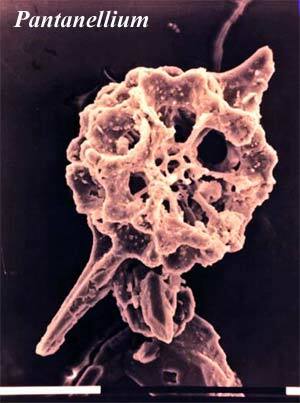 The Jurassic radiation of radiolarians was largely a radiation of the Spumellaria in the latter half of the Jurassic. Pantanellium, shown in the image, is a rather typical spumellarian. There is some speculation that this Late Jurassic recovery from a long period of decline may have been due to the availability of planktonic foraminifera as a food source. However, this remains speculation. Most radiolarian work in the Mesozoic is limited to identifying taxa for stratigraphic purposes. Surprisingly little has been done on their paleoecology or evolution. Image Credits: Iberopora from Schlagintweit 2004). Pantanellium from The Oceans course at the Univ. of Texas at Dallas. Links: Coralline Algae - Homepage of Michael Rasser; Radiolaria (MIRACLE site). ATW041105. Text public domain. No rights reserved. Jurassic Reef Park - all that you would ever need to know about Jurassic reefs. A really great site!!! These are both common Bajocian genera. The particular species shown here are Early Jurassic. Benton, MJ & DAT Harper (1997), Basic Palaeontology. Longman, 342 pp. 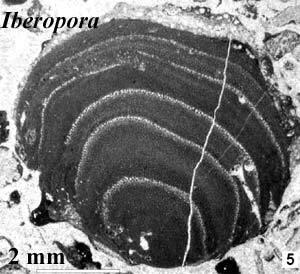 Cornet, B & NG McDonald (1995), A new cheirolepidiaceous conifer from the Lower Jurassic of North America. unpub. MS. WWW. Eble, GJ (1999), Contrasting evolutionary flexibility in sister groups: Disparity and diversity in Mesozoic heart urchins. Santa Fe Inst. Working Paper #99-04-026. WWW. Falkowski, PG, O Schofield, ME Katz, B Van De Schootbrugge & AH Knoll (2004), Why is the land green and the ocean red? in H Therstein & JR Young [eds. ], Coccolithophores: from Molecular Processes to Global Impact. Elseveir, pp 429-453. Grzebyk, D, O Schofield, C Vetriani, & PG Falkowski (2003), The Mesozoic radiation of eukaryotic algae: The portable plastid hypothesis. J. Phycol. 39: 259–267. Radwanska, U & A Radwanski (2003), The Jurassic crinoid genus Cyclocrinus D’Orbigny, 1850: still an enigma. Acta Geol. Pol. 53: 301-320. Ruban, DA (2004), Diversity dynamics of Early–Middle Jurassic brachiopods of Caucasus, and the Pliensbachian–Toarcian mass extinction. Acta Palaeontol. Pol. 49: 275–282. WWW. Schlagintweit, F (2004), Iberopora bodeuri Granier & Berthou 2002 (incertae sedis) from the Plassen Formation (Kimmeridgian–Berriasian) of the Tethyan Realm. Geol. Croat. 57: 1-13.
text content by M. Alan Kazlev Creative Commons Attribution License 1998-2002 except as otherwise stated.